Future mom and dad before birth usually try to buy everything needed for baby care. If they're superstitious, then I plan to buy everything you need just after the baby is born. You need to choose many things: changing table, baby bath and cot, and bottles, and diapers, and first aid kit, and a water thermometer. This list may include a hand warmer for the newborn. However, many parents are interested in whether it is needed and is not responsible or whether the use of this product of dangerous for the baby. How useful warmer for newborns? The main task of parents is to take care of a comfortable and happy existence of their child, to save him from the different stimuli to help him cope with the disease. Dry heat not only increases the effectiveness of various medicines but also saves you from some diseases. For example, heating to get rid of pain in muscles, runny nose, otitis media and other illnesses, improve metabolism and blood circulation. Warmer for babies helps to solve all these problems. In addition, it will help your child to stay warm during a walk in the rainy and cold season. It should say that an ordinary rubber hot water bottle, which needs to be filled with water, represents a certain danger to the child. To avoid injury to the baby, should it add the not very hot water. Its temperature should be comfortable for the baby. You cannot fill the bottle to the brim, it will be enough and a small amount of water. Before you put her to the newborn, you need to check whether it is closed tightly and then wrap a hot water bottle in a thick cloth. Categorically not allowed to use electric models for warming the legs of the child. Such products can only be used for heating baby cot. Currently in the sale there are various models of the heating devices do not pose any danger when used. It deserves special attention, for example, the toy-warmer for the newborn. Its price is approximately 600 RUB. as for the ordinary products, it will cost 4 times cheaper. 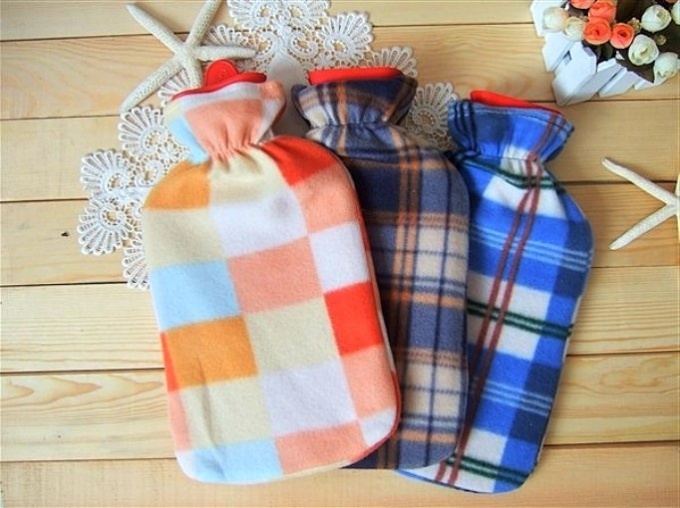 Toy hand warmer is made from natural materials. In appearance it is soft toy - a duck, a dog or other animal. The filler used petals of lavender and millet. It is very easy to use: it takes only a few minutes to heat it up in the microwave, and then put a heating pad in the crib or give the baby. The toy will stay warm for several hours, spreading light and pleasant smell of lavender. A great option would be saline warmer for the newborn. It is made of non-toxic materials and is completely safe. As a shell it is a plastic bag of high strength and integrity. Inside it provides the special salt solution, which is used in medicine. When applied correctly, no harm to baby cause she can't. On the contrary, it is a guarantee that no it will not burn and overheating. Many mothers believe that the salt warmer for newborns must be available in every home. These products are designed for prevention and treatment of many diseases. They also perform the normal functions of the children warm while walking on the street or sleep. To get started this warmer you need to click on the activator floating inside the solution, and then wait until it will not be wavy to spread the salt crystals. After that will be immediately felt warm. After a few minutes crystallized warmer mash should be in the hands and apply where needed. This baby warmer is easily take the contours of almost any body part. For kid up to 3 years it is advisable to wrap in fabric. For the little ones (including infants) must comply with distance from the body, which shall be no less than 5 centimeters.